They are always there and they do the job. I have used them for years now and see no reason to change that. I liked everything. They are always there and they do the job. I have used them for years now and see no reason to change that. I would highly recommend them. They do the job, and they do a darn good job. They are timely, efficient, and thorough. It's hard to come up with something to say. I'm pleased with them. The ladies come and do a great job. I'm really pleased with their work. Since 1976, All Bright Maids (ABM) has offered a complete range of residential cleaning and maintenance services. ABM offers maid services through its innovative online booking system with upfront pricing that makes it fast, easy, and convenient for customers to choose and customize their cleaning plans. ABM’s customers can download the “Allbright Maids” app and book their next home cleaning, pay on the go, reschedule, and more—all from their mobile devices. The company offers a variety of customizable cleaning plans to meet its customers’ lifestyles and budgets. Maid services can be scheduled weekly, every other week or monthly, and one-time cleaning options are also available. ABM handles everything from deep cleaning to lighter home detail options. 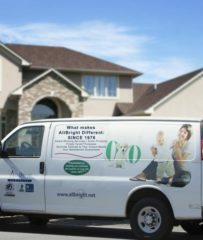 All Bright Maids sends a fully stocked service van to every jobsite. ABM has been offering residential, real estate and commercial cleaning and maintenance services to clients in Santa Clara, Alameda and San Mateo Counties since 1976. The company’s wide range of residential cleaning services includes window washing, carpet cleaning, handyman repairs (leaky faucets, screen door replacements, light fixture installations), gutter cleaning and more. It also has broad experience working with real estate agents to prepare residential and commercial properties for sale, handling everything from construction cleanup and furniture removal to pressure washing and heavy dusting. “In addition, we provide janitorial services, floor waxing and stripping, tile and grout cleaning and restoration, and other project-based services,” says Mr. Andrade. Lemon juice can be used to dissolve soap scum and hard water deposits, clean and shine brass and copper, freshen kitchen drains and more. When mixed with vinegar or baking soda, it makes an excellent paste for cleaning surfaces and removing stains. You can also mix 1/2 cup of lemon juice with 1 cup of olive oil and create a polish to use on hardwood furniture. Baking soda can be used to scrub surfaces in the same way as commercial abrasive cleansers. It also works well as a deodorizer—place a box in your refrigerator, freezer or anywhere that could benefit from odor absorption. Sodium carbonate (otherwise known as washing soda) is excellent for cutting grease, removing stains, washing clothes, and disinfecting and softening water. Don’t use washing soda on aluminum, as it may cause discoloration and erosion. Because it disinfects and deodorizes, vinegar works well as an all-purpose cleaner. Fill a clean spray bottle with one part water and one part vinegar. It’s important to dilute the vinegar, because it can eat away at the surface you’re cleaning. As long as it’s diluted, vinegar is gentle on many different surfaces, including bathroom counters, floors, kitchen counters, appliances, stovetops and toilets. Test a small, hidden area to make sure the surface won’t become discolored or damaged. Isopropyl (rubbing) alcohol provides the base for an evaporating cleaner to rival commercial window and glass cleaning solutions. Mix 1 cup of rubbing alcohol, 1 cup of water and 1 tablespoon of white vinegar in a sprayer bottle and use it to clean windows, mirrors, chrome fixtures and hard-surface ceramic tiles. Eucalyptus oil is a good disinfectant and deodorizer. It gets rid of some stains (like ink and grease), kills and repels some insects, and even attacks rust. Pure soap is nontoxic and biodegrades safely and completely. Make sure you use soap without synthetic scents, colors or other additives. Even phosphate-free biodegradable laundry detergent contributes to water pollution. Q: Are you flexible with scheduling? A: Absolutely. We understand that every client has different time commitments, so our schedules range from flexible to consistent. Either way, we provide clear communication, honesty, reliability and experience. Q: Should I leave you a key if I won’t be home during the cleaning? A: Leaving a property open and unattended can carry unnecessary risks, so we prefer that you leave a key—it makes us responsible if anything happens. 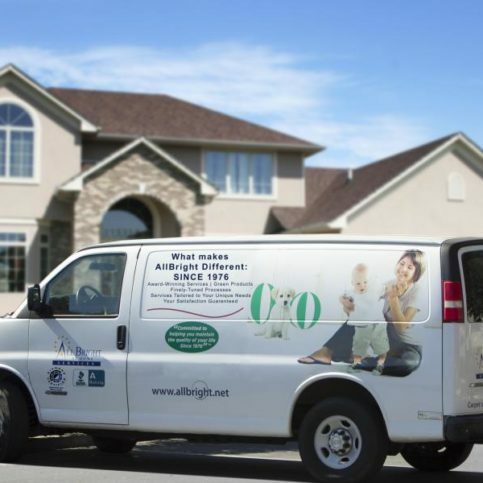 Q: What kind of carpet cleaning system do you use? A: We clean carpets with an advanced system called DriMaster, which uses high-flow cleaning heads to deep clean without penetrating carpet backing. Not only does it reach where other cleaning systems can’t, but its jet-less technology allows carpets to dry in less than an hour, which greatly minimizes the amount of time you have to wait to replace your furniture. Q: Are you good with pets? A: Yes. We often work with clients who have pets, and we have procedures and policies in place for how we treat pets on jobsites. We’ll work with you to accommodate those types of special needs. A: If any area or item we were scheduled to work on is unacceptable to your standards, call our office immediately and we’ll redo the job at no extra charge within 24 hours. Ernie Andrade is owner of All Bright Maids, a Diamond Certified company since 2008. He can be reached at (408) 372-6964 or by email. Outside of work, Ernie says his hobbies have shifted in recent years from active pursuits to more relaxing pastimes. “I love soccer, and I played and coached for many years, but these days, my favorite things to do are fish, read and visit with friends.” Ernie says he also enjoys spending time with his family, including his wife, Griselda, and their six grown children and three grandchildren. A: I like different genres, but I’m particularly fascinated with books about personal growth and development. A: Spring, because it’s the beginning of life. A: Thanksgiving, because it’s an opportunity to get the family together and express our thanks for all the gifts in life. A: I collect odd items that catch my eye. For instance, the last thing I picked up was an antique spoon made from a coconut shell. SAN JOSE — Whether you do your own house cleaning or contract the services of a professional, there are certain aspects of cleaning that can be easily overlooked. While visible surfaces tend to get cleaned on a regular basis, when it comes to hidden or hard-to-reach areas, it’s often a case of “out of sight, out of mind.” However, many people don’t realize that neglecting these areas can lead to sanitation issues, especially in rooms like the kitchen and bathroom. In the kitchen, areas such as behind the refrigerator, beneath the stove or in the range hood can provide a place for dust and grime to build up. Likewise, in the bathroom, areas like behind the toilet, under the sink, or in high ceiling corners can harbor unseen mold or bacteria. In either case, if bacteria are allowed to accumulate, it can pose a potential health hazard. A good way to avoid sanitation issues in your home is to hire a house cleaner to perform deep, detailed cleanings on a seasonal basis. Having thorough cleanings performed three or four times a year will ensure that both visible surfaces and less prominent ones get cleaned. SAN JOSE — Host, Sarah Rutan: When cleaning a home, it’s easy to neglect hidden and hard-to-reach areas, but many homeowners don’t realize this can actually pose a sanitation hazard. Today we’re in San Jose with Diamond Certified Expert Contributor Ernie Andrade of All Bright Maids to learn more. Diamond Certified Expert Contributor, Ernie Andrade: The importance of deep cleaning your home – whether you do it yourself, or hire a professional – there are certain aspects of cleaning that can easily be overlooked. Neglect in these areas can lead you to health and sanitation issues. In the kitchen, behind and under the refrigerator, filters under the hood, oven, etcetera. Bathrooms, under the toilet, shower doors, baseboards, etcetera, etcetera. The high and low dusting such as fans, curtains, baseboards, under furniture – these areas are where bacteria and mold harbors. If allowed to grow, it can potential pose a health hazard for you and your family. A good way to avoid this is to hire an experienced house cleaner before deep cleaning on a seasonal basis. The once a year, twice a year, or even three times a year does creating a healthier environment and giving you peace of mind. All Bright Maids : Average 8.6 out of 10 based on 165 unique customer surveys of customer satisfaction. I thought they did great work and have recommended them a couple times. Nothing I can think of, they just got the job done. I think they do a good job. They never miss a day. I have been using them bi-weekly for over a year now. I want to say they are always on time and great, bar none. I would say, the people who work for the company. Mostly the service manager works with them, but when we get to the facility it is amazingly clean. When we call, they make themselves available. That's all we could ever ask for. They are flexible with their services and have a wide scope of what they can do. It saves us money and time. I would give a general recommendation. I have been using them weekly for ten years. When you talk, they listen. They are always on time, never late, and top-notch. They were on time did what they were supposed to do, actually even more. I think they are dependable. There is one thing about their appearance, it is really neat which made me think they really care about how they clean my place. They are very nice and polite, I use them monthly. They do what they promise. They are prompt and effective. I have referred them a couple times. They are efficient and they work really hard. They are a hardworking team. I have no complaints. I think they do a good job. I haven't had very many cleaners to compare to, but generally speaking they are good. They show up when they say each month. We have never had an issue with them. Nothing specific, they do a great job. I thought and still think they do a great job. Sometimes they are better than others. Overall, we like using them every two weeks for the last year or so. We can trust them with a key to our home. I thought that they do the same thing every time. If the grand kids have been in there, they wouldn't straighten it up. I find all companies like this do that. The new company is less expensive. They are good. They are there when we need them. They get things done, no messing around. I would mention that they are reliable. I would tell them I had a great experience. They were reliable. Ernie is very hands on.